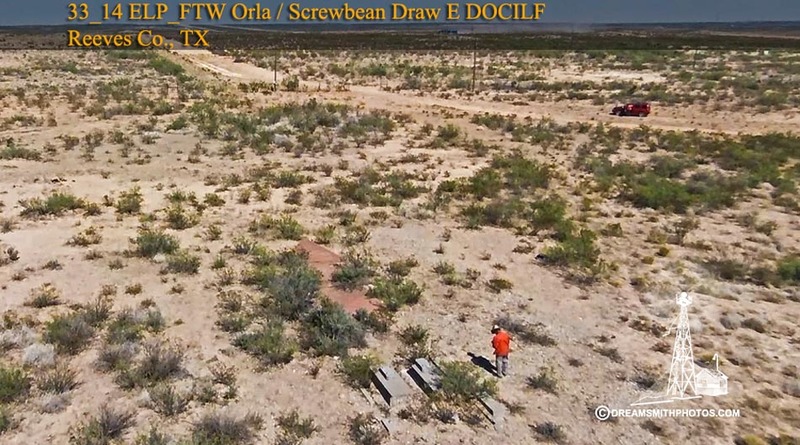 The Orla / Screw Bean Draw East Arrow is located approximately 7 miles west of Orla, Texas just off of Hwy 652. 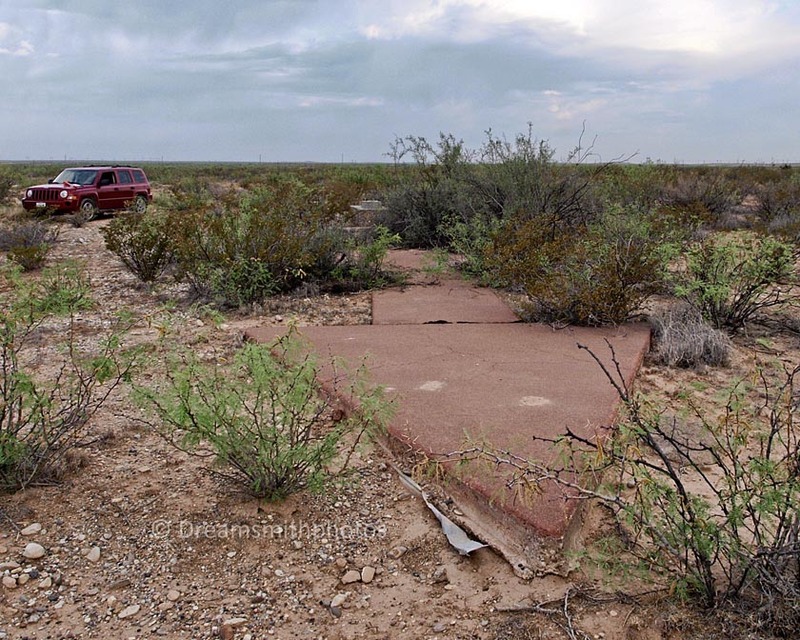 There is a narrow dirt road leading from the highway to the arrow itself. No four-wheel drive is necessary to access the arrow. The base where the generator shed once stood is in poor condition. All that remains for this section is the outside foundation of the pad, and just a portion of the interior support pad. The shaft that connects the generator pad to the beacon pad is missing. The beacon pad and the arrow however are still in good condition. The total length of the arrow is 55 feet. The pilot would approach the tail of the arrow on a compass heading of 112° (E-SE), and then exit the arrow on a compass heading of 112° (E-SE). Orla, Texas: Department of Commerce intermediate field, site 14, El Paso-Fort Worth Airway. One hundred and forty miles E. of El Paso. Altitude, 4,000 feet. T shape, 100 acres, dirt, level, natural drainage; two landing strips, 3,000 by 550 feet N./S., 3,960 by 550 feet E./W. Directional arrow marked "14 ELP-FTW." Pole line to S., fence to E., stony ridge to E. and W., hill to W. Beacon, boundary, and approach lights. Beacon, 36-inch rotating, showing alternate green and white flashes. No serving facilities. Orla, Tex. (El P.-Ft. W. Site No. 14).—Airmen landing at the intermediate field near Orla should use extreme caution due to reconditioning work now in progress. Orla, Tex. (El P.-Ft. W. Site No. 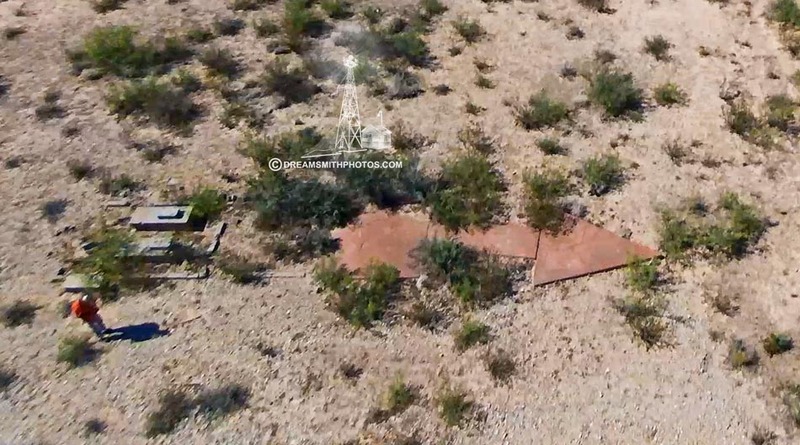 14).—The conditioning of the intermediate landing field, near Orla, 140 miles east of El Paso, has been completed and this field is now safe for landings. Orla.—Department of Commerce intermediate field, site 14, El Paso-Fort Worth Airway. Thirteen and one-half miles W. of Orla, one hundred and forty miles E. of El Paso. Altitude, 4,000 feet. T shape, 110 acres, dirt, level, natural drainage; two landing strips, 3,000 by 550 feet N./S., 3,460 by 550 feet E./W. Directional arrow marked "14 ELP-FTW." Pole line to S., fence to E., stony ridge to E. and W., hill to W. Beacon, boundary, and approach lights. Beacon, 36-inch rotating, showing alternate green and white flashes. No servicing facilities. ELP-FW-14 is about 8.0 miles by road west of Orla near the Paso-Tex Pumping Station. A 50 foot steel tower painted orange and white, 0.1 mile northwest of the pumping station, 0.1 mile west of an elevated enclosed water tank, 0.1 mile north of the pipe line road and 0.05 mile northwest of a 20 foot silver tank.